After you create an account, connect your store by clicking 'Account' in the lower left corner, then 'Settings'. 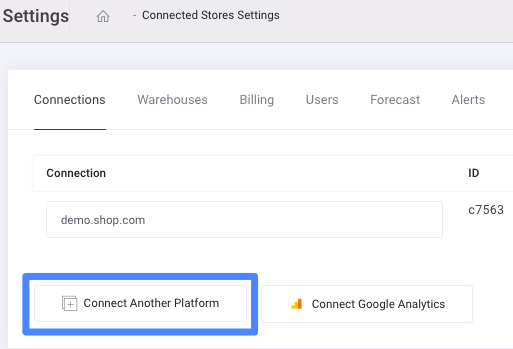 Select 'Connect Another Platform' to add your eCommerce platform or inventory management system. If you need additional information specific to your platform or system, check out our Integrations collection in the Help Center. To check your connections to ensure that the correct data is being pulled into Inventory Planner. Go to Account > Settings to see which sales channels are connected. Next, check Warehouses to see which are enabled. You may need to enable additional connection warehouses so that you can see demand detail by location.